* Creating, editing, and deleting tasks and subtasks. * Tasks have a subject, description, priority, start date, due date, a completion date and an optional reminder. Tasks can recur on a daily, weekly or monthly basis. 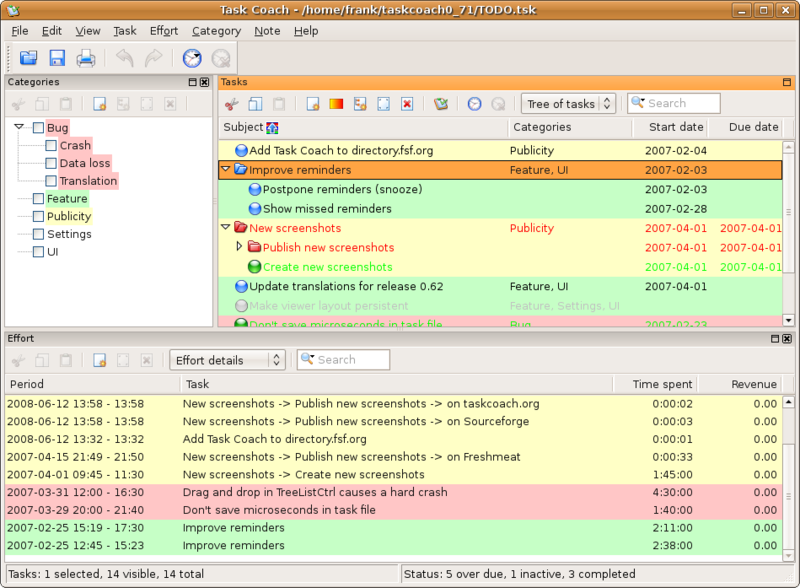 * Tasks can be viewed as a list or as a tree. * Tasks can be sorted by all task attributes, e.g. subject, budget, budget left, due date, etc. * Several filters to e.g. hide completed tasks or view only tasks that are due today. * Tasks can be created by dragging an e-mail message from a mail user agent (Outlook, Thunderbird, Claws Mail, Apple Mail) onto a task viewer. * Attachments can be added to tasks, notes, and categories by dragging and dropping files, e-mail messages, or URL's onto a task, note or category. Synchronize your Outlook XP/2003 Tasks over E-Mail. Qweas is providing links to Task Coach 1.3.1 as a courtesy, and makes no representations regarding Task Coach or any other applications or any information related thereto. Any questions, complaints or claims regarding this application Task Coach 1.3.1 must be directed to the appropriate software vendor. You may click the publisher link of Task Coach on the top of this page to get more details about the vendor.